As of Friday, the 7th August Google made a significant change to their search results. Instead of having the traditional 7 businesses represented in the local search results, there are NOW only 3. This change from Google would seem to have made it a little harder for local searchers to find local businesses via organic search. It will be interesting to see how this develops. At first glance it doesn’t seem like an obvious upgrade for users but more likely a way for Google to drive up their advertising revenues! As a result of this change, more local businesses will either be forced onto the AdWords platform or need to look for alternate avenues if they wish to increase their exposure in their local area. Of course, now there are only 3 listings compared to 7 last week. In addition to your address information and the link to your Google+ page are NO LONGER displayed in the local pack results. On the desktop version, your business phone number is now no longer displayed. 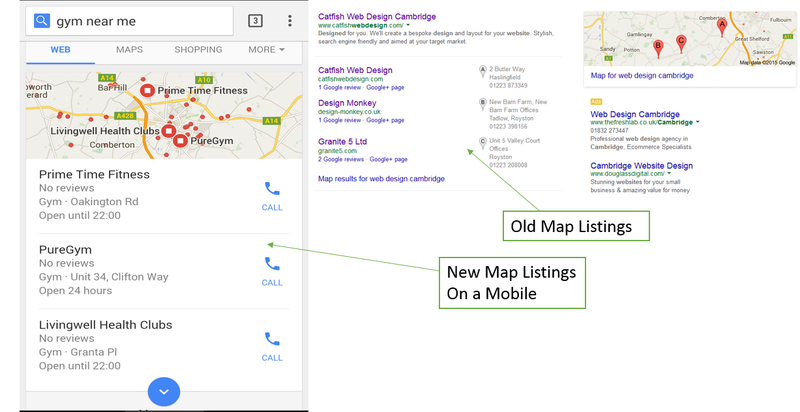 The map has moved from the top right of the Google search results to the left-hand side. Basically, if you’re not in the top 3, then you better start working on your local SEO game. Update all details including; business name, address, postcode, hours of business, main business category. Add updates to your listing. These actions alone will not get you into the top 3 positions but will provide the foundation for a local search engine optimisation strategy. As stated it doesn’t seem like an upgrade for users as important information is now more than one click away. If anything this change seems to reward larger companies with larger budgets. Some might say that Google has never been afraid of stepping on the little man to enhance their profits! However, as it is now even harder to rank in the top 3, and if you want to maintain or enhance your visibility, it might just be time to set up a local AdWords campaign.